Adult film star Stormy Daniels says that her lawyer Michael Avenatti sued President Donald Trump for defamation against her wishes. Daniels in a statement she sent to The Daily Beast on Wednesday also indicated that Avenatti started a new fundraiser to cover costs for her legal defense without her permission or knowledge and has refused to tell her how the money was being spent. She said that she is unsure “what to do about legal representation moving forward,” suggesting that she will find a different attorney and dump Avenatti, who is gearing up for a potential 2020 run against the president. For months I’ve asked Michael Avenatti to give me accounting information about the fund my supporters so generously donated to for my safety and legal defense. He has repeatedly ignored those requests. Days ago I demanded again, repeatedly, that he tell me how the money was being spent and how much was left. Instead of answering me, without my permission or even my knowledge Michael launched another crowdfunding campaign to raise money on my behalf. I learned about it on Twitter. I haven’t decided yet what to do about legal representation moving forward. Michael has been a great advocate in many ways. I’m tremendously grateful to him for aggressively representing me in my fight to regain my voice. But in other ways Michael has not treated me with the respect and deference an attorney should show to a client. He has spoken on my behalf without my approval. He filed a defamation case against Donald Trump against my wishes. He repeatedly refused to tell me how my legal defense fund was being spent. Now he has launched a new crowdfunding campaign using my face and name without my permission and attributing words to me that I never wrote or said. I’m deeply grateful to my supporters and they deserve to know their money is being spent responsibly. I don’t want to hurt Michael, but it’s time to set the record straight. The truth has always been my greatest ally. My goal is the same as it has always been—to stand up for myself and take back my voice after being bullied and intimidated by President Trump and his minions. One way or another I’m going to continue in that fight, and I want everyone who has stood by me to know how profoundly grateful I am for their support. 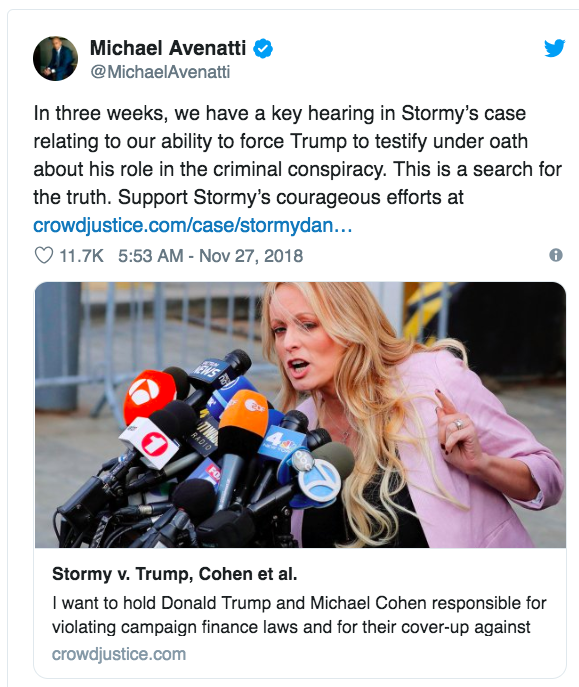 The crowdfunding page Avenatti created on Tuesday via CrowdJustice has since been taken down. He defended his move to start a crowdfunding campaign on her behalf as “simply a refresh of the prior campaign, designed to help defray some of Stormy's expenses."